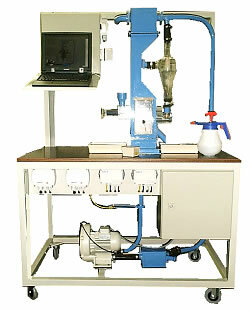 This moveable device is designed for the creation, observation and research of fluid bed drying processes. It supports continous and batch processing in open system and closed cycle system with optional bypass operation. It is designed for educational purposes and provides versatile studies in thermical, mechanical process engineering, measuring and control technique. PID-Controller for temperature (3- stage on/off control with feedback). The controller parameters can be set by the software. The proportional, integral and derivative actions of the output value can be extra recorded.